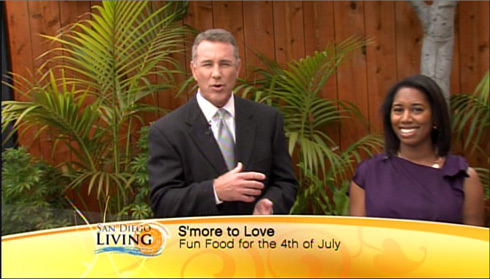 Today marks something of a milestone in my food career…my first live TV cooking demo! A last minute spot opened up on a local show so I decided to give it a shot. Other than my necklace being tucked inside the neckline of my dress (next time I will remember to bring a mirror!) things went rather smoothly and it actually turned out to be a fun experience. I showed up at the station lugging three bags full of food, cutting boards, cooking utensils and, of course, a grill. Having the chance to chat with some of the other show guests in the green room calmed my nerves a bit. Before I knew it, it was time to set up for my demo. With it being the 4th of July and all the producer suggested a s’mores theme. 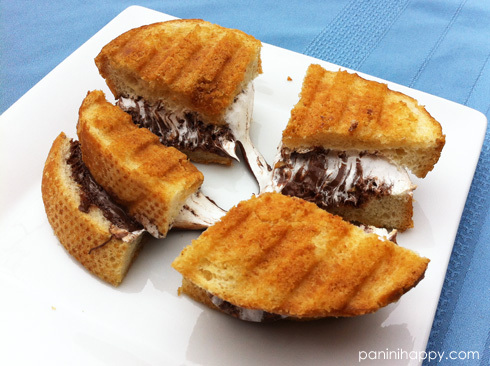 Of course, my thing is the panini maker so I came up with an idea for Nutella S’mores Panini. Think classic s’mores meets the fluffernutter: Nutella and marshmallow cream on the inside, crunchy graham cracker crust on the outside. It’s oozy and over-the-top s’mores in sandwich form. I had to test these out after my kids had gone to bed because they definitely would be clamoring for them! Heat the panini maker according to the manufacturer’s directions. In a small bowl, mix together the butter, graham crackers and sugar until they’re well combined. For each sandwich: Spread a thin layer of graham cracker butter on top of two slices of bread. Flip over both slices of bread. Spread a few tablespoons of Nutella on one slice and a few tablespoons of marshmallow cream on the other. Close the sandwich, butter side up. Grill the panini, two at a time, until the crust is crisped and golden and the marshmallow cream has melted, 3 to 4 minutes. Alternatively, if you don’t have a panini maker, you can always grill these sandwiches in a regular skillet for a few minutes on each side. Grilled Banana Bread…and our Hawaiian Vacation! Dark Chocolate Sweetheart Panini…plus a Sweet Giveaway! Great job Kathy! You are a natural on TV. I was wondering how you were going to get the graham cracker in there and your idea is brilliant. Graham Cracker Butter!! Incredible. I hope to see you more on TV! Congrats on the the TV appearance! How cool! And holy panini deliciousness! This looks incredible! What a great opportunity–you did wonderful, such a natural! These look fantastic! How fun, you are a natural for TV!! What necklace? You did an awesome job Kathy and we can’t wait to make these today! Might just have desert first : ) We’ll be checking your blog now for other great recipes and watching for your next appearance! It was nice meeting you just prior to going onto the show. It was my fist live TV appearance also. I thought you would like to know that I was in the studio when the host, Marc came back into the studio after your segment. He was raving about your s’more sandwich (off camera) to the other host, Kristen and the crew. He really loved it! It was so nice to meet you too, Nita! Yeah it was funny, after my segment was over I was still out there grilling sandwiches because the crew wanted a taste, lol. fabulous and congrats!! You go girl! Congratulations Kathy – great job, loved watching you make this 4th of July treat! You were awesome Kathy! Great combo of flavors and I love that graham cracker butter. Uhh. Yes please I will take 10 of these! And congrats! Congrats! Great TV segment! Love the graham cracker butter! Awesome Recipe! This panini sounds so good. I am a big Smores fan so I will make this for sure. Good job on SD Living! Congratulations, that’s exciting! I’ve seen a lot of creative s’mores recipes, but I think this one is near the top of my favorites list. Great idea! My husband have made this twice already. Once on our machine and once on the charcoal grill. Came out perfect and delicious both times!! Nice! I totally missed this the first time around, but you did such a great job!! This looks amazing! Linking it to my site right now! great job! you are a natural! Next post: Grilled Cheese Panzanella Salad…and More Cooking on TV!